Noting its high quality – evident even through an online reproduction – Barbara Bryant, Portraits: British 19th C Group Leader, felt Bury Art Museum’s portrait of Edward Smith-Stanley, 14th Earl of Derby must have been painted by an artist of considerable talent. Barbara Bryant worked to establish the painting as by Henry Perronet Briggs: an artist relatively unknown today, despite being a Royal Academician. In her initial proposal for discussion, Barbara noted that this sitter (then known as Lord Stanley) had a portrait exhibited at the Royal Academy in 1839 by Briggs, which was engraved by W. H. Mote and H. Cousins. 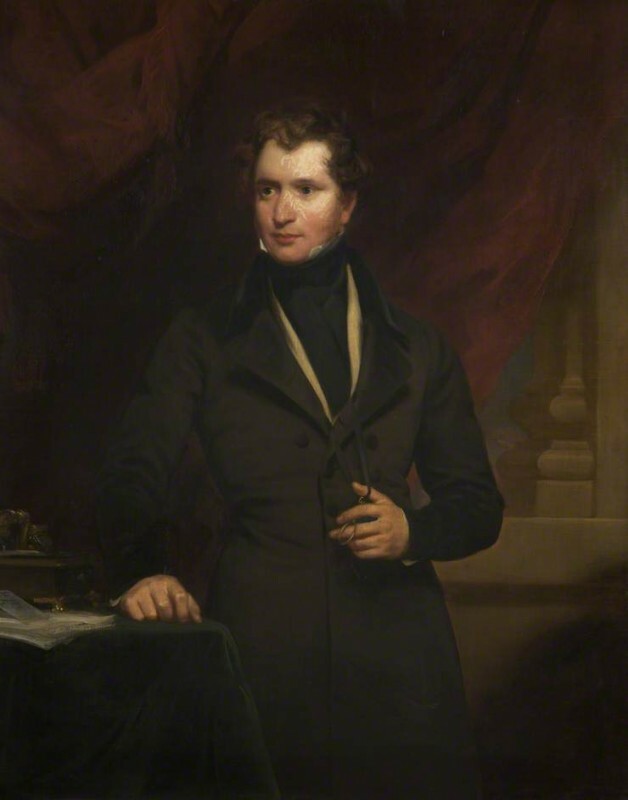 The engravings were enough evidence to confirm the artist of Bury Art Gallery’s portrait as by Briggs, yet Barbara indicated that it would indeed be beneficial to rule out the possibility that Bury’s portrait was not just a copy of Brigg’s work exhibited in 1839. Barbara indicated she was to contact someone with knowledge of the collections of the Earls of Derby at Knowsley Hall. Bury Art Museum commented to confirm the collection had no record to support the idea that the work was by Briggs rather than a copy, but agreed that the work, ‘with its swag of fringed drapery and classical column base in the background, with no hint of hesitancy or uncertainty about it’ indicated the work to be an original. They also added that ‘the painting formerly hung on the staircase of The Derby Hall in Bury’, transferred to Bury Art Museum around 10 years prior – which would later come to be a fact highly relevant to the discussion. Stephen went on to comment that the Stanley family had connections to Bury: Barbara noted in response that the 13th Earl of Derby instigated the building of Derby Hall, which was the previous location of the portrait: and it was common for portraits of building donors and their families to hang in donated buildings. The discussion was closed after Barbara Bryant made her official recommendation that the work be firmly attributed to Briggs, which the collection were happy to accept. Bury Art Gallery added, as the exhibited date was also unearthed, an execution date of ‘1839 or before’ could also enrich the record of this portrait, improving upon the earlier given date of c.1840. No longer situated among the thousands of works listed as by an ‘unknown artist’ on Your Paintings, Barbara puts forward that the new attribution of this work should be highlighted: Edward Smith-Stanley was an important politician, an educator, and a social and political reformer. Is this work by Henry Briggs himself or is it a copy?